Michelle Obama mistakenly calls herself a "busy single mother"
First lady Michelle Obama mistakenly called herself a "busy single mother" in an interview on Thursday with Burlington, Vt. CBS affiliate WCAX, before quickly catching herself and identifying instead as "busy working mom." Discussing the struggle many parents face in balancing work and home life, the first lady reached for an empathetic tone, beginning, "Believe me, as a busy single mother...or, I shouldn't say 'single' - as a busy mother..."
She seemed to catch her flub almost immediately. "You know, when you've got the husband who's president, it can feel a little single, but he's there," she clarified of her husband, President Barack Obama. "And as a busy working mom, and before coming to the White House, I was in that position as well - working, driving kids to practice, not having enough time to shop or cook, not having the energy," she added. 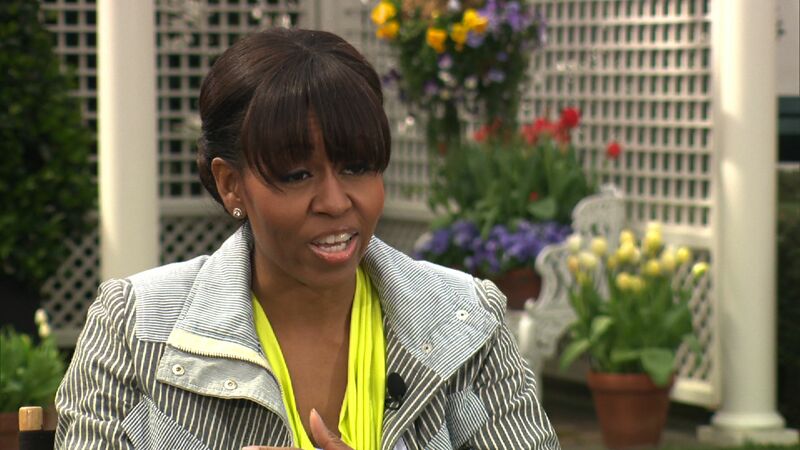 During an earlier interview with Boston CBS affiliate WBZ, which focused mainly on Michelle Obama's "Let's Move" initiative to combat childhood obesity, the first lady also addressed competing pressures faced by moms who have to juggle work and home life. "One thing I tell young women...is there's no one plan that fits everybody's life, and we have to be flexible," she said. "We have to listen to ourselves, our own passions...and not measure our successes by someone else's life."